Great version on Concert For George led by Billy Preston and and a heartfelt solo by Eric Clapton. I think this (version one) might be my favourite song on ATMP . It's a shame (a pity, even) that the Beatles weren't interested in it - it could have been one of their big epic songs of 68/69, a la Hey Jude or I Want You (She's So Heavy). Ya poor George didn't get much love for his music..... Maybe the band got a little jealous with Something and While My Guitar Gently Weeps ???? Or perhaps the timing was bad what with Paul's Let It Be and The Long And Winding Road both having slower, epic feels. Band dynamics, etc. But I think it's possible that George was already writing with an eye to "Beatles acceptable" material and his own, because he didn't want to spend time convincing them any more. Had the Beatles continued, he might have put a solo album out anyway. There's an exchange between John and Paul somewhere during the January '69 Get Back sessions, where Paul says that George's songs are every bit as good as anything they were coming up with. Harrison spent quite a lot of time that month trying to get them interested in All Things Must Pass , so it must have been fairly galling that I Me Mine and For You Blue made the final cut (chiefly due to their inclusion in the film, though I don't know how much input The Beatles had in the edit, or whether it was mainly down to Michael Lindsay-Hogg). I actually think if The Beatles had continued he would have got more songs like this on the albums. If his Abbey Road contributions hadn't been so brilliant there's every chance he'd have been able to get them interested in at least a couple of the ATMP songs. But yeah, I agree about him writing for Beatles albums and solo albums. Certainly after Not Guilty ("I won't upset the Apple cart") got left off the White Album , and he wrote Wah-Wah about quitting the band, he needed an alternative outlet. Love this song... it's so beautifully simple and meaningful. The gentle, somewhat distant disappointment and resignation of the phrase 'Isn't It A Pity '-- not fully heartbroken but simply a bit mournful-- means so much more than saying 'oh, isn't it so awful' or something equivalent. It conveys far more real emotion, to my mind. 'Tis like another While My Guitar Gently Weeps , only far more direct. I also dig this version of it-- particularly his singing the instrumental break melody. Great version on Concert For George led by Billy Preston and a heartfelt solo by Eric Clapton. "...Forgetting to give back, isn't it a pity? Billy Preston!" But I think it's really just a sort of introspection on people, and mistakes everyone makes, with a very broad scope that could apply to most anything. The Beatles were always masters at that, writing songs that were at once specific and could apply to many things. And I think that's part of their continual appeal, that everyone can sympathise with the songs, because they are accessible, and will be for as long as humans are humans. I really like the acoustic demo version that George did during the Get Back sessions. I was listening to this song today, and I noticed that at the end of the song you can hear the "Naaaaa naaaa naaa nananana nananana" from "Hey Jude ". Nice little goof, George. Its really prominent in the Concert For George version. Its a nice touch. ^That's the lyrics of Isn't It A Pity by Ella Fitzgerald (apparently). Pretty odd for such a big boo-boo to be made there. It's funny when I look at the lyrics in the preview, I get Isn't It A Pity by George Gershwin. When I click on it in full, I get Fitzgerald's lyrics. I never knew there were so many songs called Isn't It A Pity . where do the lyrics that come up on google come from?? 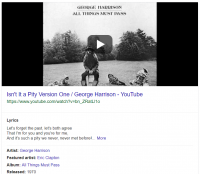 I would, @Beatlebug, but I'm afraid Google lyrics are from a different void entirely. Isn't that a pity. Is it just me, or is there something oddly similar about certain parts of Isn't It A Pity and Jealous Guy ?